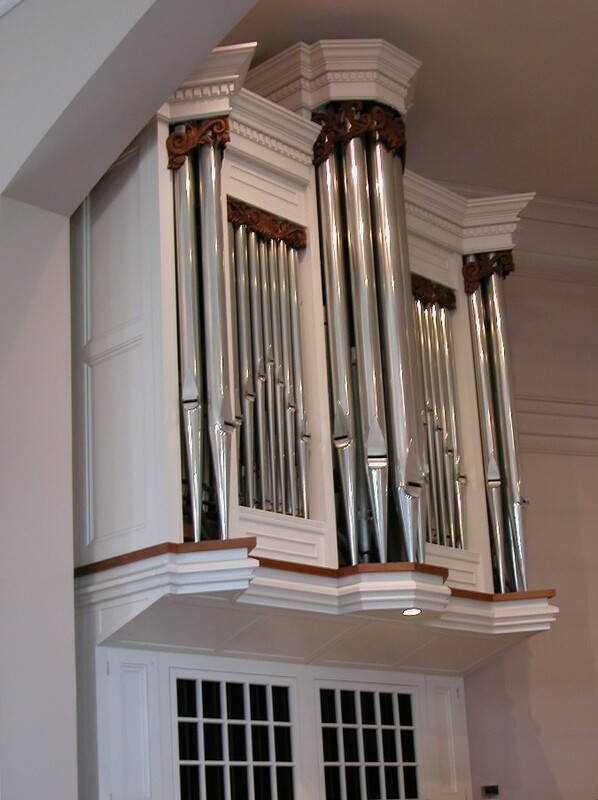 In designing an organ for a church, there are two important aspects to consider. The first is the tonal disposition of the organ. The organ must, above all else, lead the congregational singing and accompany choirs and soloists. In short, the organ sound must be compatible with the human voice. To do this successfully, the organ must have a clear, decisive sound, but yet warm and full. Each stop (set of pipes) must do its job both singularly or in combination with other stops. It must have its own distinctive sound, yet blend with the other sounds of the organ. The full chorus must be bright and exciting and to be able to sing out over the congregation and inspire all. This has been our goal with this instrument. The tonal colors have been designed for this building and regulated and adjusted for these acoustics. The second aspect is that of the physical design. The case design must work and blend with the architectural design of the building. It must also serve to focus the sound of the organ. Most of all, it must be a part of the worship area. In this instance, we chose to place the organ on the left side of the chancel, not because this is the “ideal” placement for the organ, but because it is the “ideal” placement for the worship area. We have overcome the problems of a side placement by cantilevering the main portion of the organ (the Great division) into the chancel area. The secondary division (the Swell division) is located under the main division and behind the organist. The sound is projected into the chancel and with the help of the superb acoustics of the room gets into the congregation area exceedingly well. 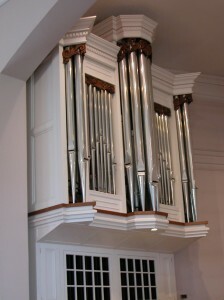 The entire organ with the exception of the blower is mechanical which means that when you press a key, a series of levers opens the valve which lets air into the pipes. This is the most sensitive and long lasting of all the available types of actions. Most of the parts are made of wood, so as long as we continue to grow trees, parts can be supplied. This mechanism should last 75 to 100 years before major work is needed. The organ itself will last almost indefinitely if it is taken care of properly.